Just recently, bash v5 was released. The discrepancy comes from the fact that bash has been licensed as GPL v3 since version 4. Apple does not include GPL v3 licensed tools with macOS. However, nothing is keeping you from downloading and installing the latest bash version. New features include, among many other things, associated arrays (i.e. dictionaries) and better auto-completion setup. While you would think this is a common desire, most pages I have found will simply point to Homebrew to download and install a newer bash version. The main challenge with using brew is that it does not work on the scale that MacAdmins require. brew is designed for single user installation, where the user has administrator privileges. brew’s workflows do not scale to large deployments controlled with a management system. Ideally, there would be package installer for the latest bash version. Unfortunately, the bash project does not provide one. In this post, I will show how you can install the latest bash version without brew and how to build an installer package for deployment. This requires Xcode or the Developer Command Line Tools to be installed. First, download the source for the latest bash version from this page. As of this writing the latest version is bash-5.0 and the file you want is bash-5.0.tar.gz. Once downloaded, you can expand the archive in Finder by double-clicking. Open a Terminal window and change directory to the newly expanded bash-5.0 directory. Then run the configure script there. The configure process will take a while, there will be plenty of messages showing progress. Once the configure process is complete. You can build bash with the make command. This will build the bash binary and the supporting files in the current directory. That’s not where we want it in the end, but it is probably a good idea see if the build process works. This will (again) take a while. There will be some odd looking warnings, but you can ignore those. This will build and install the bash binary and supporting files in /usr/local/bin and /usr/local. sudo is required to modify /usr/local. If you were just looking for a way to install bash v5 without brew, you are done! There is more useful information in the rest of the post, though, so keep reading! 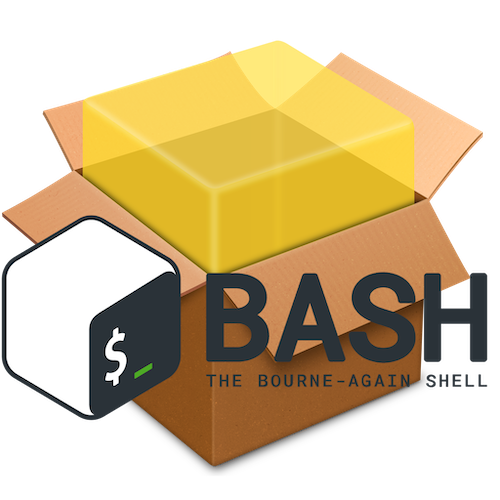 By default, the bash v5 binary is called bash and will be installed in /usr/local/bin. The macOS default PATH lists /usr/local/bin before /bin where the default bash v3 binary, also called bash, is located. This means, that when a user types bash in to a shell, the version in /usr/local/bin will be preferred over the pre-installed bash v3. But when you then run bash it will invoke /usr/local/bin/bash, so it will run the new bash v5. It will show this in the prompt, but you can also verify the BASH_VERSION. This might be the setup you want, when you want to use bash v5 always. It might lead to some unexpected behavior for some users, though. One option to avoid this ambiguity is to rename the binary in /usr/local/bin to bash5. But then other tools such as env (mentioned below) will not find the binary any more. Note: the PATH in other contexts will likely not contain /usr/local/bin and further confuse matters. Scripts using bash, should have the full path to the binary in the shebang. This way, the script author can control whether a script is executed by the default bash v3 (/bin/bash) or the newer bash v5 (/usr/local/bin/bash or /usr/local/bin/bash5). The env command will determine the path to the bash binary in the current environment. (i.e. using the current PATH) This is useful when the script has to run in various environments where the location of the bash binary is unknown, in other words across multiple Unix and Unix-like platforms. However, this renders the actual version of bash that will interpret the script unpredictable. For example, assume you have bash v5 installed in the default configuration (as /usr/local/bin/bash. A script with the shebang #!/usr/bin/env bash launched in the user environment (i.e. from Terminal) will use the newer bash, as /usr/local/bin comes before /bin in the search order. When you launch the same script in a different context, e.g. as an installation script, an AppleScript, or a management system, /usr/local/bin will likely not be part of the PATH in that environment. Then the env shebang will choose /bin/bash (v3). The script will be interpreted and might behave differently. Administrators prefer certainty in their managed environments. Administrators should know the location and versions of the binaries on their systems. For management scripts, you should avoid env and use the proper full path to the desired interpreter binary. Even though we have installed bash v5, the default shell of a new Terminal window will still use the built-in bash v3. The path to the default shell is stored in the user record. You can directly change the UserShell attribute with dscl, in the ‘Advanced Options’ of the ‘Users & Groups’ preference pane, or in Directory Utility. The chsh (change shell) command will check for allowed shells in the /etc/shells file. You can easily append a line with /usr/local/bin/bash to this file, and then chsh will work fine. Note: if you choose to rename the bash binary, you have to use the changed name in /etc/shells and with chsh. Remember that just running chsh will not change the shell in the current Terminal window. It is best to close the old Terminal window and open a new one to get the new shell. While these steps to install and configure bash v5 on a single Mac are simple enough, they would not work well with a management system for hundreds or thousands of Macs. We want to wrap all the files that make install creates into a package installer payload. By default, make install' will install all the files in/usr/local/bin,/usr/local/libetc. You can specify an installation prefix other than/usr/localusing–prefix, for instance–prefix=$HOME`. This sounds like a workflow ripe for automation. You can get the script from this repository. You can pass a different (valid) bash version number as an argument to the script, e.g. 4.4.18. (I did not test anything significantly older.) The script does not autodetect the latest version and defaults to version 5.0 when no argument is given. When an update to bash v5 is published, you will have to modify the version line or run the script with an argument. Apple sent an email to developers, stating that later this months, two-factor authentication will be required for Apple IDs used for developer accounts. If you, like me, use separate Apple IDs for your personal iCloud and your developer accounts, this will pose some kind of challenge. There is a solution, however Apple does not document it very well. Update: Apple now has a very detailed support page for this topic. Assumption: you have two-factor authentication (2FA) enabled on your primary, personal Apple ID, and are logged in to that account on your Mac(s) and iOS devices. If you haven’t done that yet, do it now. 2FA does increase your account security significantly. You can enable 2FA on any device logged in to the account in the iCloud Settings or preference pane. As part of the setup you can provide one or more phone numbers as a fall back mechanism. If no devices can be prompted through Apple’s built-in 2FA, it will send an SMS to the trusted phone numbers. You can use the same phone number for multiple Apple IDs, but there seems to be some limit on how often you can do that. Assumption: The secondary account is your developer Apple ID, you don’t use it for iCloud storage, device backups, mail etc. You use it to log in to developer.apple.com and iTunes Connect, and to get all the certificates and other resources you need as a developer. The challenge here is that you can only enable 2FA on the first account logged in to iCloud on a device. You could log out of your primary iCloud account, and the log in with the secondary, but this will disrupt a lot of things on your device. I’d rather avoid that. On a Mac, you can have a separate iCloud account for each local user. So, it is easiest to create a second user account, log out of your first account, log in to the new second account and set up iCloud and 2FA for the developer Apple ID on this second local account. You can sign in to the secondary Apple ID enable 2FA in System Preferences -> iCloud -> Account Details -> Security as described in Apple’s Support Article. 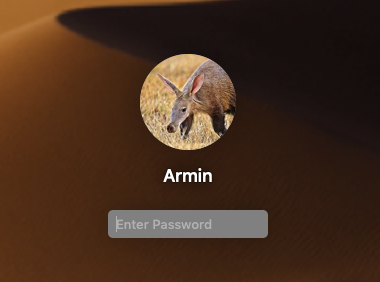 Once 2FA is set up, we don’t need the second user account on the Mac any more. Sign out of iCloud, log out of the second account and back in to your normal user account. If you are ok with using SMS authentication (Apple calls this ‘two-step authentication’, rather than ‘two-factor authentication’) then you are done. However, many will argue codes over SMS are not good enough for secondary authentication, so we want go to ‘full’ 2FA. 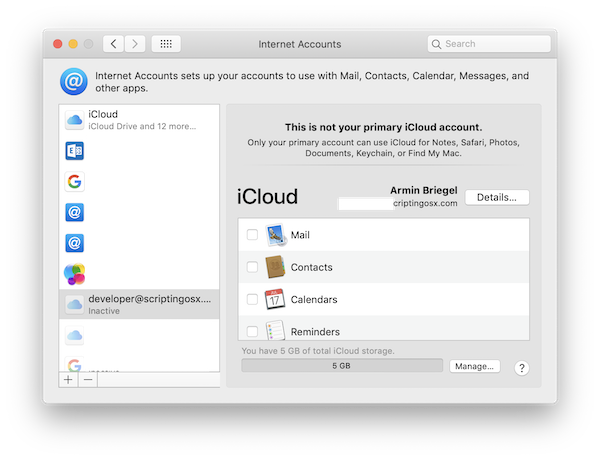 As it turns out, you can be logged in to multiple iCloud accounts on the same device or account. Certain services, such as iCloud storage, or the Photo Library, will only work with the primary iCloud account, but other services, including 2FA, will work for all iCloud accounts. On your iOS device go to Settings > Passwords & Accounts > Add Account, and choose to add another iCloud account. You probably want to turn off all services, like Mail, Calendar, etc. secondary account. On the Mac you can do the same in System Preferences > Internet Accounts. You can use both your Mac and iOS devices for 2FA. Now the secondary Apple ID will prompt the devices you are logged in as for 2FA. Last year I posted about a useful app to read and edit property list files: PLIST Editor. In its last update (1.15) the app gained a feature which is tremendously useful to MacAdmins: it can now open signed property lists. MacAdmins regularly encounter signed property lists when they download configuration profiles (.mobileconfig) from a management server. Since the cryptographic signature is binary data wrapping the property list, most property list editors, such as Xcode or PlistEdit Pro, choke on the signature. The new PLIST Editor (1.15) now detects a signed mobileconfig and will automatically unwrap the plist data from the signature and display a notification. When you click on the notification, you will get more detailed information on the signature itself. This addition will be very useful for my workflow and think for other MacAdmins as well. PLIST Editor is available in the Mac App Store for US$3.99 (price will vary depending on region). User groups are easy, right? A user is either a member or they are not. Once you start thinking about the deatils and want or need to automate some of the aspects of user and group management on macOS, there is a lot of devil in those details. You can easily list all groups a given user is a member of. The id command will show all the groups the current user is a member of. id -Gn will list just the groups. Add a username to the id command to see the information for a different user. The groups command does the same as id -Gn. Note: you should not attempt to manipulate the GroupMembers or GroupMembership attributes directly. Use the dseditgroup -o edit command to manage group membership instead. dseditgroup syntax is weird, but it is a really useful tool. Study its man page. Sometimes (mainly for security audits) you need to list all the members of a group. With the above information, it is easy enough to build a script that checks the PrimaryGroupID, the GroupMembership attribute and the recursively loops through the NestedGroups. This is confused by the fact that PrimaryGroupID stores the numeric User ID, GroupMembership uses the shortname and NestedGroups uses UUIDs. Nevertheless, you can sort through it. In most cases this script will work fine. But, (and you knew there would be a “but”) macOS has a very nasty wrench to throw in our wheels. There are a few groups on macOS, that have neither GroupMembers, GroupMembership, nor NestedGroups, but still have members. This is because the system calculates membership dynamically. This is similar to Smart Playlists in iTunes, Smart Folders in Finder, or Smart Groups in Jamf Pro. $ dscl . list /Groups Comment | grep "calc"
The most interesting calculated groups are everyone, localaccounts, and netaccounts. These groups can be very useful in certain environments. For example in a DEP setup you could add localaccounts or everyone to the _lpadmin and _developer groups, before the user has even created their standard account. That way any user created on that Mac will can manage printers and use the developer tools. While it would probably not be wise to nest the everybody group in the admin group, a malicious user could do that and hide from detection with the above script (or similar methods). Instead of recursively listing all users, we can loop through all user accounts and check their member status with dseditgroup -checkmember. This script is actually much simpler and dseditgroup can deal with calculated groups. This works well enough when run against all local users. I strongly recommend against running this for all users in a large directory infrastructure. It’ll be very slow and generate a lot of requests to the directory server. Because of this the script above runs only on the local directory node by default. They show as action buttons in the Finder in Column View and the new Gallery View. You can also access Quick Actions in any view from an item’s context menu. You can configure Quick Actions in the ‘Finder’ section of the ‘Extensions’ Preference Pane. The four sample actions that come with Mojave are ‘Rotate,’ ‘Markup,’ ‘Create PDF,’ and ‘Trim’. While these are certainly useful, they are oriented towards media. 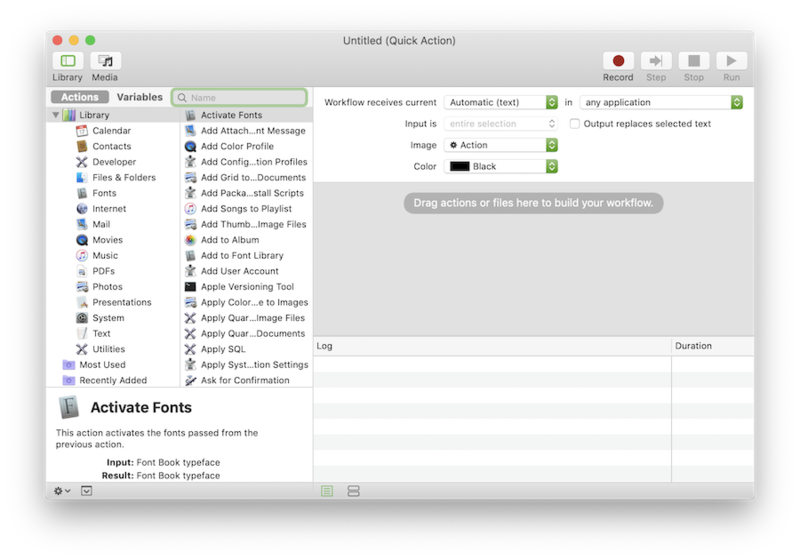 You can, however, build your own Quick Actions with Automator! When you look at it closely, Quick Actions are re-branded Automator Service Workflows. They are even stored in ~/Library/Services. Let’s build a useful Quick Action for admins. This allows you to build an installer package from a disk image without having to install it. This seems like a good candidate for a Quick Action. Open the Automator application and create a new Workflow. Choose “Quick Action” as the type of Workflow. Make sure that the shell popup is set to /bin/bash and the ‘Pass input’ popup is set to ‘to stdin’. With these settings, the selected file(s) will be passed as a list of paths, one per line to the stdin stream of the bash code we enter in the text area. First, we set a bash variable for the destination folder. You can change this to another path if you want to, but the destination folder has to exist before the workflow runs, otherwise you’ll get an error. Then we use a while loop with the read command to read the stdin input line by line. Then we run the quickpkg tool once for each line. You can now save the Workflow (it will be saved in ~/Library/Services/) and then ‘QuickPkg’ (or whatever name you chose) will appear in Finder, for any selected item. Unfortunately, the Automator input controls don’t allow to filter for file types other than the few given ones. Select a dmg with an application in it, such as the dmg downloaded from the Firefox website and wait a moment. Then check the ~/Documents folder for the result. It is annoying that we have to manually open the destination folder to see our result. But the nice thing is that we can let the workflow take care of that. In the action list on the left, search for ‘Reveal Finder Items’ or locate this action in the ‘Files & Folders’ category. You can drag it to the end of your workflow, below the ‘Run Shell Script’ action or just double-click in the list to add to the end of your workflow. Save and run again from the Finder. It should now reveal the pkg file automatically. You may have noticed during testing that in its current form the workflow doesn’t really react well when something goes wrong. quickpkg can work with .app, .dmg, and .zip files. Unfortunatly, Automator does not let us filter for just those file types in the input setup. The script will report an error when you try to run it against a different file type, but the error is not displayed in Finder. osascript -e "display alert \"QuickPkg: An error occured: $result\""
With this code we check result code $? of the quickpkg command for an error. If the code is non-zero we display an alert with osascript. If all went well, we echo the result (the path to the new pkg) to stdout, so that Automator can pass that into the following actions. This is still a fairly crude error handling, but much better than nothing. It is quite easy to turn simple shell commands into Automator workflows and Finder Quick Actions. Keep this in mind, when you find yourself performing repetetive tasks in Finder or in Terminal. Apple has included a tool to build a bootable external installer drive with the macOS Installer application for a while now. Apple actually has documentation for this tool. The tool is called createinstallmedia and can be found in /Applications/Install macOS [[High ]Sierra | Mojave].app/Contents/Resources/. When run, the tool requires a path to an external volume or partition, which will be erased and replaced with a bootable installer volume. Note: Secure Boot Macs with the T2 chip cannot boot from external drives in the default configuration. As of this writing this affects the iMac Pro and the 2018 MacBook Pro. But it is expected that any new Macs released from now on (as in maybe at the Apple Event tomorrow?) will also have Secure Boot. Nevertheless, having an bootable external installer is still every useful for ‘legacy’ (i.e. non-secure boot) Macs. Also, while it not a good general configuration, it can be very useful to enable external boot on machines that you frequently re-install for testing. 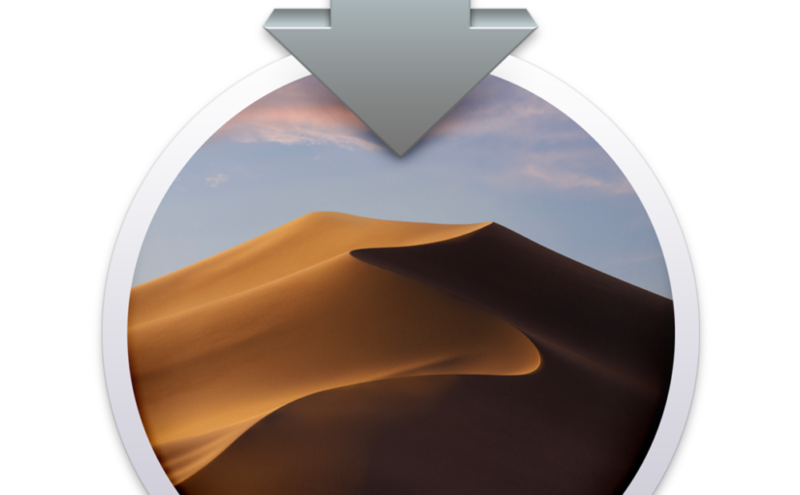 While the support article covers the basics, the tool gained a new feature in Mojave which is not documented in the article. --volume, A path to a volume that can be unmounted and erased to create the install media. --nointeraction, Erase the disk pointed to by volume without prompting for confirmation. --downloadassets, Download on-demand assets that may be required for installation. This tool must be run as root. The new argument in the Mojave is called --downloadassets. The description is a bit sparse, but from what I gather this is download additional assets, like firmware installers and bundle them with the other installer files on the installer drive instead of downloading them on-demand during installation. This will not remove the requirement for the Mac to be connected to the internet during the installation process but it should speed up the process quite a bit. Now only if there was as simple a tool for setting the profile pic! There is no simple tool, but it is not that hard really. When an individual user wants to change their login picture, they open the Users & Groups preference pane. But if want to pre-set or change it for multiple Computers or Users, then we need to script. This will dump a lot of data, some of it binary. When you look more closely at the data, you can see that the binary data is in an attribute JPEGPhoto. This is promising, but converting an image file into some binary code and writing it into the attribute does not sound fun. When you look around the user record some more, you can find another attribute labeled Picture which contains a decent file path (it may be empty on your machine). When JPEGPhoto contains data, Picture will be ignored. But when we delete the JPEGPhoto attribute, then the system will use the file path set in the Picture attribute. $ dscl . create /Users/username Picture "/Library/User Pictures/Flowers/Sunflower.tif"
With this you can create a script that resets all user pictures by looping through all the available pictures in the /Library/User Pictures folder. Of course, you don’t have to use the pre-installed User Picture images, but can install your own. To demonstrate how this would work, I conceived of a little fun exercise. I wanted to write a script that sets the user picture to an image from the ‘User Pictures’ folder which starts with the same letter as the username. The set of images in the default cover 19 of the 26 letters in the latin alphabet. I created images for the seven missing letters (A, I, J, K, Q, U, and X). To run the script at login, I created a LaunchAgent. And finally a script which will set the Picture to the appropriate path. Since LaunchAgents run as the user, we need to be a bit more careful when changing the attributes. While a user has privileges to modify and delete the JPEGPhoto and Picture attribute, they cannot create the attributes, so our sledgehammer method to overwrite any existing value from the script above will not work. The dscl . change verb, which modifies an attribute has a weird syntax which requires you to pass the previous value as well as the new value. To get the previous value, which may contain spaces, I use the same PlistBuddy trick from this post. Finally, I built an installer package which installs all the parts (the additional images, the LaunchAgent plist and the script) in the right places. You can get the project here. Run the buildAlphabetUserPkg.sh script to build an installer package. Since the LaunchAgent will trigger at a user’s login, you will have to logout and back in, before you can see any changes. You could add a postinstall script that loads the launchagent for the current user (when a user is logged in), but I will leave that as an exercise for the attentive student. The consulting team at Pro Warehouse has been working on an application. I mentioned this application in my talk at MacSysAdmin. The application is called ‘EraseInstall’ and provides a user interface which runs the startosinstall --eraseinstall command, which is part of the macOS Installer application. The startosinstall --eraseinstall command with all its options is fairly accessible for an administrator. There have been some attempts to make the command more accessible to end users. With Mojave, Apple is enforcing the requirement to have an active internet connection before you start the installation. The startosinstall command will fail if it cannot reach Apple’s servers. Also on Secure Boot Macs, you really want a user to have Find My Mac disabled before a system is wiped. We chose to build an application with an interface that runs the necessary checks and displays a summary, before the startosinstall --eraseinstall is launched. EraseInstall will show three screens, the first will explain what the application does (wipe everything!) and then you will get a summary of the checks. In this initial version we check whether the system has APFS, if Find My Mac is enabled and if there is an internet connection. WARNING: the app as we have posted it is fully functional and will erase and install the system on which it is run. Please only run this on a test machine! You can download an installer and the source code for the EraseInstall application here. The installer will put the EraseInstall.app in /Applications/Utilities/. You need to install, copy or download the “Install macOS” application (for 10.13.4 or higher) through your management system, VPP or manually. Many organisations like to set or pre-set the Desktop Picture of managed Macs. There are a few options for Mac Admins. One of the commonly used methods may break in macOS Mojave because of the new security and privacy controls for AppleEvents, also known as TCC. 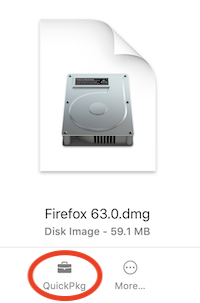 Unless you want to use one of the default macOS Desktop Picture images, you will first need to get the image file on to the client. The best way of doing that is with an installer package. Note: installing a single image file to /Library/Desktop Pictures is actually the first exercise/example in my book “Packaging for Apple Administrators.” Get that for a more detailed description. I will use the same example desktop picture as in the book. You can use your own desktop picture or download BoringBlueDesktop.png from the book’s resources. Note: Desktop pictures on macOS can be many file formats. PNG and JPEG are most commonly used. The new dynamic desktop pictures of macOS Mojave have the heic file extension. Then copy the image to the payload folder. The resulting pkg file will install the image file in /Library/Desktop Picture. Note: the pkgbuild command has many options and arguments. If you get one of them slightly wrong it can lead to unexpected behavior or even break the installation. I recommend using a script to run the pkgbuild command to avoid errors. You can find a sample build script here. Read the book for a more detailed explanation of pkgbuild and the build script. If you prefer, you can use munkipkg, which also simplifies and automates the process of building pkg installers. This will provide the image in a location that the user might look for. However, for better management you want to set the desktop picture as well. Once the image file is in place. You can set the desktop picture with a configuration profile. Many management systems will have an option in the ‘Restrictions’ payload where you can set the path to the desktop picture. With this configuration profile in place, the desktop picture is locked. The user can still open the Desktop preference pane but the selection will be ignored. You would need to be able to remove the profile to change the desktop picture again. This is very useful in education and other strictly managed environments. In other, less tightly managed environments, you might prefer to set an initial desktop picture, but allow the user to change it later. tell application "Finder" to set desktop picture to POSIX file "/Library/Desktop Pictures/BoringBlueDesktop.png"
Note that this sets a user preference so it should be run as the user. See this post for details. However, with macOS Mojave, Apple is introducing new Privacy and Security measures which require user approval for processes to send AppleEvents. This will put a severe limit on the use of osascript for admin scripts. One solution would be to whitelist your management system’s agent which allows it to send Apple Events to the Finder. This requires managing the client with a user-approved MDM. Another solution is to avoid AppleScript and Apple Events entirely. To do this, I wrote a simple command line tool which can read and set the desktop picture. Neil Martin had the brilliant idea to call it desktoppr. Since the desktoppr tool also sets user preferences, you still need to pay attention that it runs as the user. This LaunchAgent will reset the Desktop Picture at every login. When you find yourself building LaunchAgents or LaunchDaemons often (i.e. more than once) you should really consider using outset. $ mkdir -p "payload/Library/Desktop Pictures/"
$ cp /path/to/BoringBlueDesktop.png "payload/Library/Desktop Pictures/"
With attributes like the UID, it is fairly safe safe to assume that there will be no whitespace in the value. With other attributes, such as RealName or NFSHomeDirectory, you cannot make that prediction with certainty. Real names may or may not have been entered with a space. A user (or management script) may have changed their home directory to something starting with /Volumes/User HD/... and your script may fail. The resulting property list is a dict containing a key with the native attribute name and an array containing the values, even when there is only one value. Note that the xpath output does not include a final new line character, which makes it look a bit strange. As I said, the xpath solution makes a lot of assumptions about the layout of the property list. A safer way of parsing property lists would be a dedicated tool, such as PlistBuddy. However, PlistBuddy does not read from stdin. At least not voluntarily. Note that you have to escape the : in the attribute name, since PlistBuddy uses the colon as a path separator. This uses nested command substitution with the $(... $(...) ...) syntax which is not possible using backticks. Either way, you can get a safe value from dscl in shell script, whether it contains whitespace or not.